Navistar used its VT275 diesel engine in Low Cab Forward trucks by Ford. The secret to the source of power on this block is the twin turborcharger setup. A change to the emissions standards in the mid 2000s required a change to the V series nomenclature. The MaxxForce 5 and the used VT275 engine on sale at this website are the same. What you get is a raw 200 horsepower in the diesel series. This block is compatible with the Ford five-speed transmission. You can identify this unit by the Torqshift name. In most automotive documentation, the 4.5 VT275 is called the Powerstroke. The shipping weight for just the block itself is a little over 800 pounds. The compression in this motor is gigantic. The 18:0:1 is big for a smaller displacement engine. There are 275 cubic inches that are on display in the Navistar builds. Although you can still find these units, they were terminated from active production in 2010. There are not many junk yards in the U.S. or in Canada that have such a complete inventory like GDE has. You can remove the block yourself and do the swap in your own garage. Mechanics also end up on our shipping list for deliveries. Not every person has the personal confidence to remove the VT275 engine and drop another one inside. If you are wondering about a warranty plan, our company does provide you with a good policy. Every one of the VT275 engine for sale assemblies that are featured here are shipped immediately upon payment. We know how hard it is to find a reputable diesel parts dealer on the Internet. We do not limit our inventory to just Ford or related brands. Most of the International trucks were equipped to hold the 4.5 liter V6 inside. Swap your old diesel for one with lower miles. We validate and date stamp all of the stock you can order. We know what yard it came out of. We even know the discount we received when we bought it. All of this information is coupled into the final selling price. 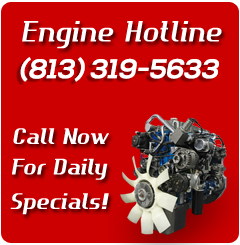 We distribute sale prices for the used Navistar engines we have on this site in quote formation. View the details and then make your decision to buy. Take a look around inside the database we built for you to use here. It does not require a log in or even a username. It is just a free tool that lets you have a closer look at our products. You will be given a price and then you may order. Our toll-free phone number is what people call to order our used MaxxForce 5 and regular VT blocks offline.